Projects will eventually provide a way for users of new RefWorks to have the functionality of legacy RefWorks' multiple accounts. The first release of Projects is limited to creating and managing Projects. Future releases will allow users to select which Project to use with writing tools and the ability to share Projects. For this initial release, each RefWorks account is given an untitled project containing all of the references from the account. 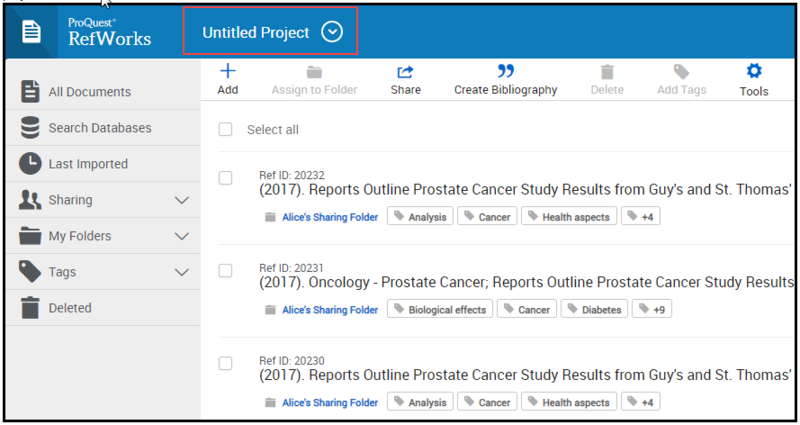 Advanced users who are working on multiple research projects and want to keep references for each project separate can create separate projects from the My Projects page. One thing to note with Projects is that "You can select which project is used when you use RefWorks Citation Manager to write a document. Only references from a single project can be included in a document, so be sure that all of the references you want to cite in your document are available in the project you select." So using Projects is a good way to keep references separate from one other. This is especially useful when working with a group or on a paper like a systematic review.